This past Thursday, March 5th, was sort of my unofficial debutante ball, if you will. While there were no frilly dresses or father-daughter dances anywhere in sight, there was quite a lot of buzz, warm wishes, and plenty of good eats. The event was the annual Vinho Verde Wine Tasting, held at the Astor Center in New York City. I was asked to speak about the marvelous ability of Vinho Verde, Portugal’s iconic wine from the Minho region, to pair with so many types of food. And to drive home the point, the uber-talented chef Jacqueline Lombard made no fewer than 19 dishes from my upcoming book, The New Portuguese Table, for the crowd of 150. I have to admit, at first I was hugging the walls in dread. Never have I had so many guests eat my food at one time. But after watching people go back for seconds, and even thirds, I was relieved. Eventually, some nibblers figured out I was the author and suddenly a camera was stuck in my face for an interview for Portuguese TV, business cards were exchanged, a guest appearance on local TV was scheduled, and tons of advanced copies of the book were requested. Three days later, I’m still recovering. For those unfamiliar with Vinho Verde, aka “green wine,” it wasn’t named, as many believe, in honor of the stunningly lush and green Minho region from where it hails nor for its yellow-green color (there are rose and red Vinho Verdes out there). Rather it got its moniker because the wine is meant to be drunk young, usually within a year of pressing. 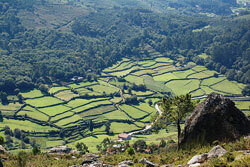 That’s what has characterized Vinho Verde for more than a century. But change is afoot. Nowadays, some producers are making wines, especially those with a higher content of Alvarinho grapes, that have an expected life span of several years. Short, non-wood aging and the use of the Alvarinho varietal soften the high acids of the wine and allow the fruits flavors–crisp green apples, luscious peaches, snappy pears, and, of course, citrusy lemon-lime–to assert themselves, as well as give the wine more structure so it can last longer than one season. Something that was obvious in the 2007 versus the 2008 wines we tasted. What makes Vinho Verde play so well with a wide variety of foods is its low alcohol content (ranging from nine to 13 percent), light body, and pleasant dryness. Some of the foods from my book that paired well with the wines were shrimp, fish, duck, pork, lamb, salads, as well as desserts, including chocolate. But the wines also hold up to strong flavors; they don’t shy away from two of Portugal’s favorite ingredients: garlic and cilantro, which were well represented that night. Traditionally, Vinho Verde is served as an aperitif, as some of the wines have a slight petillance, or effervescence, and make for a festive pour. But these days, a lot of cooks make it a point to have the same Vinho Verde, or several different ones, carry guests from hors d’oeuvres to dessert. And its my go-to white wine for the summer. Several well-chilled bottles of Vinho Verde–the recommended temperature is 45 to 55 degrees–are ideal at a barbecue, cookout, or picnic. Some names to look out for are Ponte da Barca Loureiro 2008, Ponte da Barca Rosé 2007, Muralhas de Moncao 2008, Quinta da Aveleda 2007, Dona Paterna 2008, Casa de Vila Verde 2008, Portal do Fidalgo 2007, Quinta da Lixa 2008, Arca Nova Loureiro 2007, Quinta de Santa Maria Colheita Seleccionada 2007, and Gazela NV. And from my Twitter pal Andre Ribeirinho Palacio da Brejoeira 2005. In the last edition of Revista de Vinhos, there’s a long article on a vertical wine tasting of Quinta do Soalheiro, starting with wines from the ’70s. Suprisingly enough, some of the old wines revealed an extraordinary capacity for aging–this goes against the common knowledge that says vinho verde should be drunk young, the younger the better. Alvarinho is an extraordinary Portuguese grape that deserves to be better known worldwide. In Portugal it’s now spreading to other areas besides the Vinho Verde region. It combines very well with Antão Vaz in the Alentejo and with Maria Gomes/Fernão Pires everywhere. I bet a combination with Chardonay would be an instant sucess.Alvarinho grapes also make for very good espumantes (sparkling wines), full of ripe and mellow tropical aromas, enlived by a nice acidity. Nuno, I’ve tried a Quinta do Soalheiro Alvarinho, and it is wonderful. Haven’t tried the Primeiras Vinhas, but now it’s on my list.